The dreamlike whirl of Tibetan bowls, occasionally punctuated by bells in the beginning of the first cut “Opening to a New Perspective” sets the stage for all that follows in this slow-evolving inward expansive meditation that drifts and swells gently, unfolding as it goes. At nearly 20 minutes it’s the longest piece on the disc, ample time to introduce the classic vintage analog synths and sequencers as well as some relatively modern digital keyboards, all the while soothing the spirit and illuminating the inward path as it guides the listener down the eternal spiral. 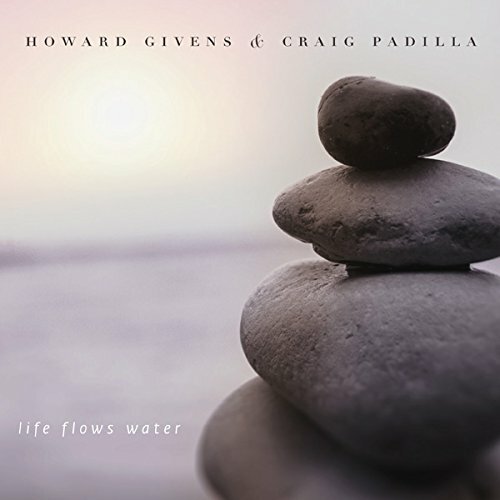 Shimmering melodies emerge from the flowing textures on subsequent pieces like “A Step Achieved,” while heavily processed ephemeral sounds of night insects and birds seem to make an appearance on “Reflection and Metamorphosis.” Givens and Padilla are both masters of the floating ambient form, the latter with numerous releases to his credit (over 24 at last count, either solo or in collaboration with others), many of which have been reviewed in these pages, the former is the founder and guiding light behind the Spotted Peccary label and associated studios, and his own Brain Laughter project. One can’t listen to this without hearing the occasional reminders of early Tangerine Dream, Klaus Schulze, and other pioneers who put this open ended form of electronic music on the map, but a lot of evolution and subsequent development has ensued in the years since, and Givens and Padilla are two of the groundbreakers at the forefront of it all. Life Flows Water is one of those recordings that one could play in an endless loop for a week and it would still be as magical as it was at the very first moment.